These are the monotonous words of a blank-faced Israeli solider in response to Adeeb, an inhabitant of the village of Bil’in in the West Bank, who insists on planting a small olive tree beyond the fence where his land once thrived. Co-directed with Guy Davidis, an Israeli activist in Bil’in, 5 Broken Cameras is the first Palestinian film ever to be nominated for an Academy Award. It follows the lives of farmer-turned-protestors who depend on cultivating the land for their livelihood by gathering the produce of bees and olive trees, as well as raising cattle and poultry. Since the inception of the wall in 2005, Israel has taken approximately 60 per cent of the land in Bil’in – the most fertile section no less – to build Israeli settlements. As such, ordinary people have risen to demonstrate peacefully after Friday prayers every week, with Emad’s cameras as intimate witnesses to the events which unfold. To chronologically build the narrative of this film – which was edited down from an incredible 700 hours of raw footage – we meet Emad’s fourth son Gibreel, who is born with the purchase of the first camera and is a character to melt the hardest of hearts. Through Gibreel’s large brown eyes, we are able to analyse the situation with a clean perspective, as the influences slowly set in, as his personality begins to formulate, and as he begins to observe the protests and aggressive arrests with an intensity reminiscent of adult wisdom. 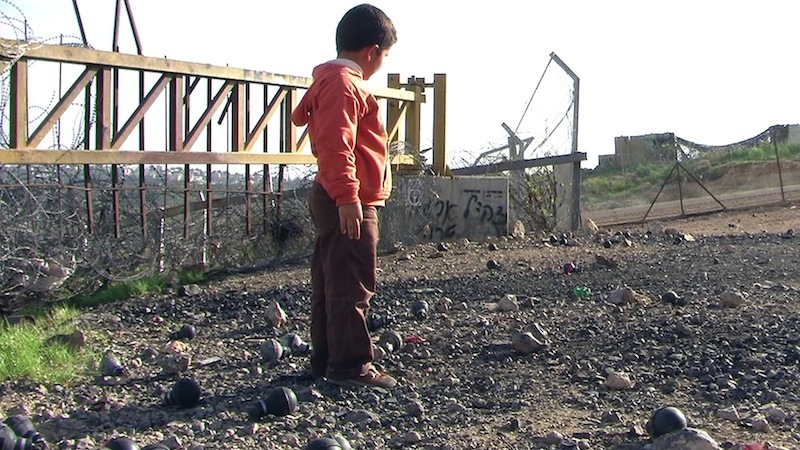 Emad shows that the villagers of Bil’in are normal people facing abnormal obstacles. Gibreel celebrates every birthday with a crowd of family and friends, who appear dressed in jeans, tshirts, jumpers – sometimes bandanas – and they certainly know how to throw a party. These scenes are juxtaposed with Gibreel waddling through the Israeli fence offering a soldier a leaf from an olive tree, Gibreel squeezing his father’s belly fondly after the latter’s return from hospital, and the children watching a 2010 World Cup match in excitement. Yet, every moment of the film is riddled with an air of melancholic fatigue. The sky is cast with a hazy desert dustiness and a forced silence, even as the majestic olive trees are harrowingly uprooted or otherwise burnt to a charred white colour by soldiers during the night. In fact, the most shocking moments of violence are void of glossy slow motions or dramatic music, so the audience is left with a sense of tragedy which is so natural and so real, with precious little time to grieve. And all the while, Emad refuses to cease filming. Even as I research this article beyond the confines of the cinema space, I am disturbed to find the film’s characters and stories in the news. The events in Bil’in haven’t had a chance to be buried safely in history and that’s what makes the film so exceptional. It is with this in mind that I now reflect on my meeting with Emad Burnat. For him these are fresh wounds, having lost his closest friends to bullets and imprisonment only recently. He greets me with calm humility and discusses his film with restrained emotion. In a climate where news is often misreported, Emad emphasises the need for people to tell their own stories and to change perceptions. Part of the reason why Emad wanted to work with Guy Davidis was to show the film to the Israeli people whom he had no access to, and this has been successful so far. Since completing the making of the film at the end of 2011, Emad has attended hundreds of screenings all over the world. On his seventh visit to the United States this year, he was held at the airport for questioning. But he believes that perceptions are changing. Emad has huge hopes for the future, and tells me he is considering making a fictional movie visualising Palestine in 20-25 years. But he’s also got other plans. “I’ve decided to continue filming and follow the changes. While I’m here, my son continues to film the Friday action. “I was thinking about my next project and I’d like to build an academy in the village with a theatre, and to teach children editing skills and how to make documentaries. I think this actual project will feature in my next film. “I will stay in Bil’in. I will never leave my village or my home. Will definitely be watching this film after reading this moving review, good job!